[FRANKSTON, TX | APRIL 13-14] After an extremely long Round 1, plagued by rain and thunderstorms, and a beautiful final round, it took a pair of extra holes to settle the championship in the girls division at The Tyler Rose, but when Kansas’ Madison Slayton drained her 3-foot putt for par on the second playoff hole, she captured her first Elite Series victory on the Texas Junior Golf Tour and punching her card into the 2nd Annual Elites Cup Invitational at the end of summer. 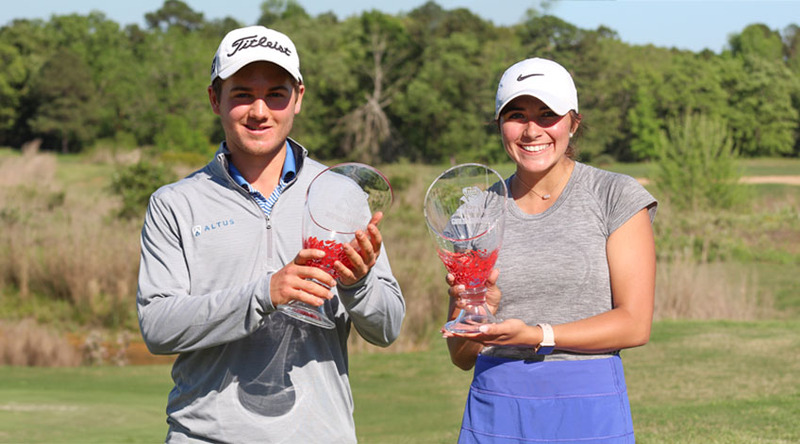 It was a back-and-forth battle all day between Slayton and Houston’s Elizabeth Patrick, with Patrick holding a 2-shot lead as the two stood on the 10th tee box. Slayton then rattled off 2 straight birdies to tie Patrick, but made a triple-bogey on the par-4 15th hole, and stood 2 shots back heading to the 18th tee. When Patrick’s second shot on 18 found the water, Slayton was able to capitalize, making a difficult par while Patrick made double-bogey, and the two headed to extra holes. Both players tied the first playoff hole with pars, but when Patrick’s par putt narrowly missed on the second hole, Slayton had the opening she needed, ramming home her own par putt to secure the victory. Rounding out the Top 5 in the Girls Division was Chandler’s Sidney Robertson, who finished solo 3rd, Flower Mound senior Kate Dishman in fourth, and Sydney McConnell and Graci Henard, who finished T5. The Boys Division was equally as exciting, as LoneStar Boys champion Ryan Goldfarb and The Woodland’s Lucas Wright battled it out on the back 9 of the final round. After 9 holes, Goldfarb held a 3-shot lead over Lucas, but made two quick bogeys on holes 10 and 11 to see his lead shrink to just a single shot. The competitors traded pars throughout the back 9, but two sloppy bogeys seemed to doom Lucas as the two headed to the 18th hole, Goldfarb holding a 4-shot lead. But the par-5 18th had been yielding low scores all day, and Lucas canned a miraculous eagle, putting the pressure squarely on Goldfarb’s shoulders. When his par putt missed, the pressure mounted even more, but he calmly rolled in his bogey putt, giving him a 1-shot victory and his second Elites Cup championship of the season. Rounding out the Top 5 in the Boys Division was Alejandro Alonso and Spencer Olejniczak, who finished T3, and Jack Gilbert, who finished in fifth. To view photos from the event, check out the Tyler Rose album on Flickr. The Tyler Rose is one of the Elites Cup qualifier tournaments of the 2018-2019 season. To learn more about the Elites Cup, visit www.elitescupinvitational.com for exempt tournaments and to apply for an at-large spot.